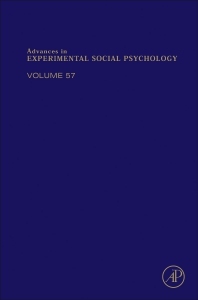 Advances in Experimental Social Psychology, Volume 57, the latest release in this highly cited series in the field, contains contributions of major empirical and theoretical interest that represent the best and brightest in new research, theory and practice in social psychology. Topics discussed in this new release include the Consequences of Thought Speed, Attitudes Towards Science, What Makes Moral Disgust Special? An Integrative Functional Review, the Psychological Roots of Inequality: How Hierarchical Processes Produce and Perpetuate the Class Divide, and a section on Contextualized Attitude Change, amongst other timely topics. This serial is part of the Social Sciences package on ScienceDirect, and is available online beginning with Volume 32.